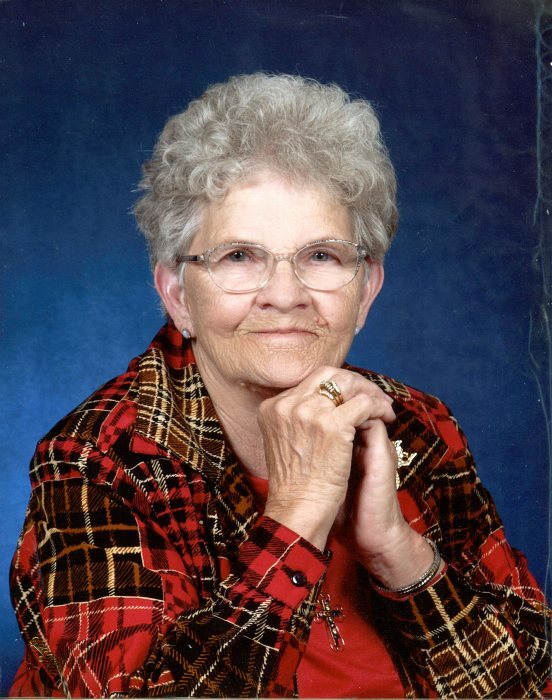 Berta Mae Wafer Wallace, 87 of Forreston, Texas passed away Sunday, February 03, 2019. She was born on August 02, 1931 in Waxahachie, Texas to the late Robert Allen & Dolly Mae Rodgers Wafer. Berta was an avid fisherman, a great cook, loved to quilt and repaired dolls for many people in the community. She loved animals and worked side by side with her husband on the ranch for many years. She will be dearly missed by her family and all that knew her and loved her. She was preceded in death by her parents, her husband Jessie Wallace in 1999, two brothers, three sisters and one Great Great Grandchild. Services to celebrate her life are scheduled for 10:00 Am Wednesday, February 06, 2019 at the First Baptist Church of Italy with Rev. Ronnie Dabney officiating. Interment will follow at the Italy Cemetery. Pallbearers will be Steve Harmon, Travis Harmon, Jeff Martin, Josh Boyd, Dustin Rosemond, Bryce Ballard. Honorary Pallbearers will be Hunter Ballard and Wesley Mason. Visitation with the family is scheduled for Tuesday, February 05, 2019 from 6:00 pm to 8:00 pm at the Wayne Boze Funeral Home in Waxahachie.